experience project. As for the technical expertise, Mr. Kulla & Mr. Schneider from Fakultätswerkstatt Architektur will accompany us with their knowledge and Experience during the whole workshop and the implementation of the exhibition. The topic of the workshop is about reusing EUR-Pallets as a recycled material, which demonstrates the project´s concept for development in the informal settlements in Cairo: LOW-Cost, LOW-Tech, and Re-Used sustainable architectural interventions. 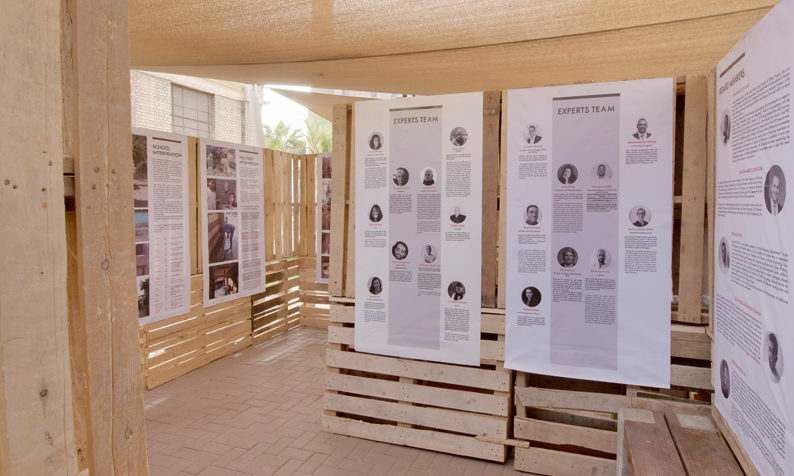 EIE 2018 showcases and discuses EZBET Project’s experiences in community development in the informal settlements in Cairo and the participatory approaches – Bottom Up Approaches that enable the communities to be part of the process and the decision making of upgrading their world without changing its Logic, Culture and Identity. The exhibition will be an interactive platform for visitors to understand the context and witness the prototypes of the interventions in Egypt. Expected Outputs: Technical report with architectural details of the Euro-Pallet as well as the other innovative materials used in the exhibtion.